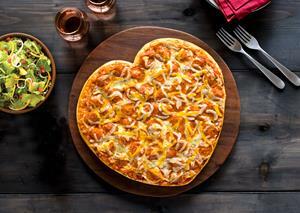 Bake it up a Notch™ this Valentine’s Day with Papa Murphy’s HeartBaker® Pizza | Papa Murphy's Holdings, Inc.
VANCOUVER, Wash., Feb. 05, 2019 (GLOBE NEWSWIRE) -- Papa Murphy’s Holdings, Inc. (NASDAQ: FRSH) is pleased to announce the return of its Valentine’s Day favorite, the HeartBaker® Pizza. The festive pizza is shaped like a heart, perfect for an easy night in and available now through February 14th both online and in-store at participating locations nationwide, starting at $9 (prices vary by location). Customers can also bring home a Sweetheart of a Deal, which includes a HeartBaker® Pizza and Chocolate Chip Cookie Dough starting at only $12 (prices vary by location) and is available in-store and now online for the first time! The HeartBaker® Pizza starts with Papa Murphy’s fresh dough, made-from-scratch daily, and then is topped with traditional red sauce, loads of our 100% whole-milk Mozzarella cheese that's grated fresh daily, and premium pepperoni. The fastest way to enjoy a HeartBaker® Pizza is to order online. After about 15 minutes at 425 degrees in your oven, the HeartBaker Pizza is ready to enjoy with those you love. To find the Papa Murphy’s location nearest you, please visit www.papamurphys.com. To connect through Facebook, visit www.facebook.com/papamurphyspizza. A photo accompanying this announcement is available at http://www.globenewswire.com/NewsRoom/AttachmentNg/59b4eed6-4906-4909-9499-a7850505b4e2.